Adalyn “Addy” Wallace was three years old when her family found out about the tumor. It was October 2015, and her parents Jared and Melissa had transported Addy to a Sarasota hospital after finding blood in her stool. Initial tests came back negative, but the doctor felt a mass in Addy’s stomach and ordered a CT scan. The scan results revealed that the family must make an immediate trip to Johns Hopkins All Children’s Hospital, where Addy was admitted with a diagnosis of a Stage 3 Wilms’ Tumor on her right kidney. A rare form of kidney cancer that primarily affects children, Wilms’ Tumor tends to be diagnosed in children under 5. To save Addy, her entire left kidney had to be removed and a three-phase treatment process including chemotherapy began. “Addy kept smiling through it all and cheering up all those around her,” Melissa said. The treatment efforts bring new challenges for the family. At the first sign of a fever, Jared and Melissa have to pack up Addy in the car and make the two-hour drive from their Ft. Myers home to the Tampa Bay area. At the halfway point, they stop to check her temperature. If it’s going down, they head back home. If not, they continue to Johns Hopkins where their team of doctors and nurses will be waiting to help Addy. This will be an ongoing challenge, as Addy’s treatment will continue for the next year. In addition to the removal of her kidney, Addy also had surgery on her lung to remove a lesion, and the family is concerned about the spread of disease. Time has been another important factor: Jared, a fifth-grade science teacher, has used up his leave time, and Melissa has faced the same struggles with her employment, but together the couple has endured and strengthened their relationship. And they’ve had help in meeting this challenge. Fundraisers held in both Florida and their home state of Michigan by friends and family help with the mounting bills and unpaid expenses. And whenever they must stay in the Tampa Bay area for Addy’s treatments, they come to the Ronald McDonald House. “There is always good in the world, and there are people to help, if only you ask. We were humble enough to ask.” Jared said. While at RMH, Jared and Melissa have become good friends with other families at the St. Pete East House, often pausing to chat with others about their children. Like any child, Addy hates all the poking and prodding that comes with the treatment, but she remains a happy and active child who looks forward to playing with other kids at Ronald McDonald House. 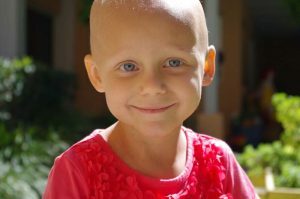 Tough, goofy, and optimistic, she shrugged off the loss of her hair due to the chemotherapy and retains a natural ability to make friends with other children staying at RMH, which has helped her through a treatment regime stronger than most endured by adults. Through it all, the family has become closer to each other and closer to God. They welcomed a new daughter, Lily, in April 2017. They celebrate the victories and hold tight when things don’t go as expected, which has made Jared reflective and thankful for how far Addy has come and for what the future may bring for them.